Still rely on a fragile paper? A new, top-notch KeepSolid Sign is here to make your life much easier, safer, and paperless. The app allows you to esign and send any documents in a timely manner. It is the right time to say goodbye to a print-and-scan practice and increase your productivity. KeepSolid Sign is free to download and try for 14 days! We offer a top-notch e-signature solution that will allow you to fill and sign documents smoothly and help improve negotiation and decision-making processes, as well as profits. Make the signing process quicker, easier, and more effective with KeepSolid Sign. You don’t need to go back and forth with paper copies anymore. Сomplete any document in minutes – simply import, sign, and send. Moreover, you can open a document in the KeepSolid Sign app from any storage or email client. Thanks to the high-grade AES-256 encryption, your sensitive data is totally secure, leaving no chance for unauthorized parties to intercept it. Download files from templates, various cloud storages, camera roll, or simply drag & drop them into the app, and get these files instantly synchronized across all your devices. Unexpected issues with the internet connection are no longer a problem! 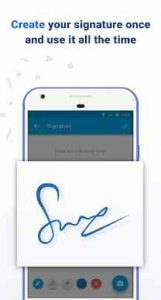 KeepSolid Sign offers you a top-notch opportunity to perform a lot of actions, including creating an electronic signature, adding annotations, and more, even being offline. KeepSolid Sign is a very handy tool that allows you to initiate a deal in a few simple clicks and get all your contracts signed in minutes. With our service, you will improve the experience of a real-time collaboration with partners and speed up agreement processes. With our time-saving and secure solution, you can constantly keep in touch with your remote colleagues and timely manage any process that requires your signature. KeepSolid Sign will allow you to always be up-to-date about the progress and status of each document and be able to accurately plan your further strategic steps. If you work with standard forms or documents often, templates will be an efficient and time-saving option. Сreate your own templates for any documents you need. After that, you only have to sign and send – it’s that easy! It may be useful if you only need to collect signatures, but I can’t even find a way to add initials to a document with this. Jim, Sorry to hear that you’ve faced with any issues while using our service. You can find detailed instructions on how to use KeepSolid Sign here: www.keepsolid.com/sign/knowledgebase Also, we have a 24/7 customer support service available via support@keepsolid.com , so if you have any questions – they’d be happy to assist. Thank you for your kind words, Maria. Our team is working very hard to provide our users with the best service, so we are pleased to hear that you are enjoying it. Thank you for choosing KeepSolid Sign!